One day it's all for the last time, and it's not the day you expected. It's not your last day in Florence. In the silence of your texts and phone calls, you feel him shut the door on a world you barely tasted. ...And then again, a strong case for it. You're a college student abroad. You're on your own journey of self-indulgence through the Tuscan countryside with nothing but the boots on your feet and leather jacket on your back. You hike to Fiesole alone, wander Siena alone, trace the entire perimeter of Florence with your own two feet, always alone. You may trip a lot on the cobblestone but you are, without a doubt, the best travel companion you've ever had. And for the first time in a long time, you like being with yourself. Then you meet him at a bar. You meet him at a bar down the way, and despite his Gucci tshirt he doesn't seem 1/8 the tool that picks up women at bars or wears Gucci tshirts. Small talk turns to deep musings, deep musings turn to dinner, dinner turns into an almost-relationship. A fling. He lives in the same quarter as you, just a 10-minute walk away, and you close the 10-minute gap in long strides. Your fling is the bridge across two worlds, and all it takes is 10 minutes. Dates are a series of exciting introductions. You introduce him to your photography, your dogs back home in Texas. He introduces you to his favorite bands, his collection of Woody Allen films, his aunt who runs political campaigns for the city's left party. He invites you to his parents' villa in Bagno a Ripoli a couple weekends down the line, and you star and circle and cover it in red hearts on your calendar. In Italy, you're constantly reminded you're different. It's in the color of your skin, the shape of your eyes, the street vendors who sneer at you ni hao! It's in the two men at the table next to you discussing you like a lab specimen, debating your ethnicity almost philosophically for what feels like an eternity as you pretend not to understand everything. But he takes you places you could never hope to see as an outsider. And for the first time in Florence, you're inside. New places come into your acquaintance like new friends: a cinema by the Arno, a secret corner of Boboli Garden, a sidestreet that winds serpentinely through the townhomes from your house to his. The city is a museum, and he's the best curator you've ever had. He cooks you dinner. He helps you with your Italian homework. He walks you home. Then one day, as you're crossing the Ponte Vecchio he kisses you. Just like that he fills places across the city with memories, completely reassigns meaning to them, and you become as infatuated with them as you are with him. You eat together, work together, walk together. He shows you the underbelly of Florence nightlife, and you've graduated past bars full of drunk Americans to ambient clubs. He drives you to a discoteca on the banks of the Arno, and although you have exams the next morning, you sit there listening to him talk about his fears and hopes and dreams all night. You eat together, work together, walk together. Sometimes you talk to each other in English, other times in Italian. You decide it's much better to sweet talk in Italian -- but you'd take fighting in English any day. Your fluency rockets, and your professor asks how you suddenly got so good. Despite how much you think of him, only a fraction of your thoughts breach the surface. You'd text him everyday if you could but only check in sporadically. You daydream about weekend trips more exciting and farther away than his parents' villa -- Lucca, Viareggio, oh Venice! He's the best travel companion you could ever imagine. You eat together, work together, walk together. One night, after dinner, he slides his hand up your thigh and tells you he wants to take your relationship "next level." Physically. You eye your shoes, then his shoes, then the door, and you mutter something about not being sure if you're ready. He looks disappointed. He walks you back home in silence, and although you're together, it's the loneliest feeling in the world. Despite how much you think of him, you check the calendar. One month left in Florence. You know you're not ready. You don't have the time to be. But you give him all you're comfortable with, all your thoughts and affection and future weekends, and that's the best you can do. You eat together, work together, walk together. Then one day it's all for the last time, and it's not the day you expected. 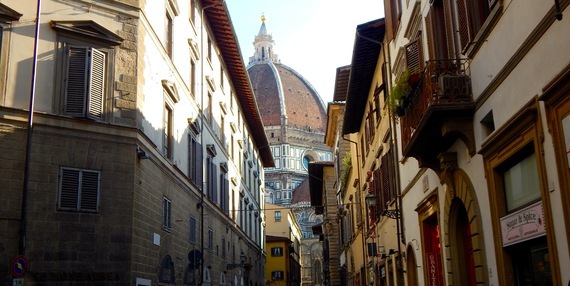 It's not your last day in Florence. In the silence of your texts and phone calls, you feel him shut the door on a world you barely tasted. You have a strong inkling why, but he never served you his reasons on a silver platter. Closure is a luxury no amount of deductive logic or Stanford Computer Science degree can afford you. "Closure is a luxury no amount of deductive logic or Stanford Computer Science degree can afford you." You look at a calendar full of empty weekends, and you can literally see all the wasted time: the time spent together, the time planned together, the time apart but spent thinking of him. You're so angry at him, for wasting all this time. You're angry at yourself, for thinking it could end any other way. For investing all your thoughts and affection and future weekends in a man who didn't think it was enough. For still missing him. The places that were once happy memories are tainted -- the cinema by the Arno, the secret corner of Boboli Garden, the sidestreet that winds serpentinely through the townhomes from your house to his. Even the most iconic monuments of Florence, the freaking Duomo and the Ponte freaking Vecchio, were shared with him. In all their presence, you feel his absence. You go through the motions like every Cosmo post-breakup column tells you. You go to class. You speak when spoken to. You come home before curfew. Still, through all the Italian homework and meals alone and bars full of drunk Americans, he's on the backburner. Sometimes it's too hard to go through the motions, and you wake up in the middle of the night crying. You overanalyze and extrapolate the situation into ruts. You eat gelato like it's your day job, and you hug a lot of people, be it friends or family or hapless Italian strangers, voraciously taking their love without explaining why you need it. You're too ashamed. You're ashamed to be grieving for a fling. Piazzale Michelangelo is a terrace that overlooks the entirety of Florence, and from it you can see all the colors of the city blend together: the green of Boboli Garden spilling into the Arno, the red cupola of the Duomo against a backdrop of blue Appenine mountains. It's the most beautiful thing in the world. You watch a tour guide point out landmarks across the city and evangelically shout out their history: "Here we see above the Ponte Vecchio the Vassari corridor, constructed for the Medici to cross the city without fear of assassination!" You see the awe in all these American tourists' faces, the deep admiration for something so old and beautiful and significant. And for the first time in a while, you feel it too. The Ponte Vecchio is no longer his place; it's the monument you've loved and studied since childhood. For the first time in a while you see Florence for what it always was, a living and breathing Renaissance. It's all the food and art and beautiful idiosyncracies inbetween that made you fall in love the first time. It's not him, and it's not the setting for your botched romance either; it's the city you chose to live in. For the first time in a while you see him for what he was. Yes, he was nice and smart and ridiculously good-looking. But he also drove too fast, smoked too many cigarettes, talked too much about himself without asking about you -- and at the end of the day, he gave you up when he couldn't get in your pants. Yes, he was a big part of your narrative here, but he wasn't the entire book. He was only a chapter. Your last couple days in Florence you do it all again, for one last time that feels like the first. You hike to Fiesole alone, wander Siena alone, trace the entire perimeter of the city with your own two feet, alone. You trip a lot on the cobblestone but you are, without a doubt, the best travel companion you've ever had. And for the first time in a long time, you like being with yourself. Lea Coligado is a student at Stanford majoring in Computer Science with a minor in Italian. She likes writing about social impact, travel, and occasionally about her feelings.